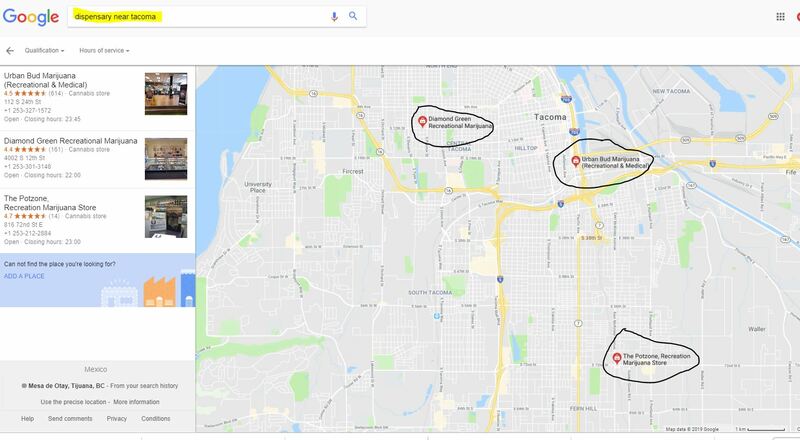 Local Businesses disappearing on Google Maps when Plurals Use. I have a recreational marijuana dispensary client located in Tacoma Washington. Before I do any SEO work for a client the first thing I do is a keyword research to determine the most searched terms and begin my work from there. In this case, we will use MOZ keyword explorer and type in the word dispensary and the following report listed below will show the top searchers per month for your business niche. 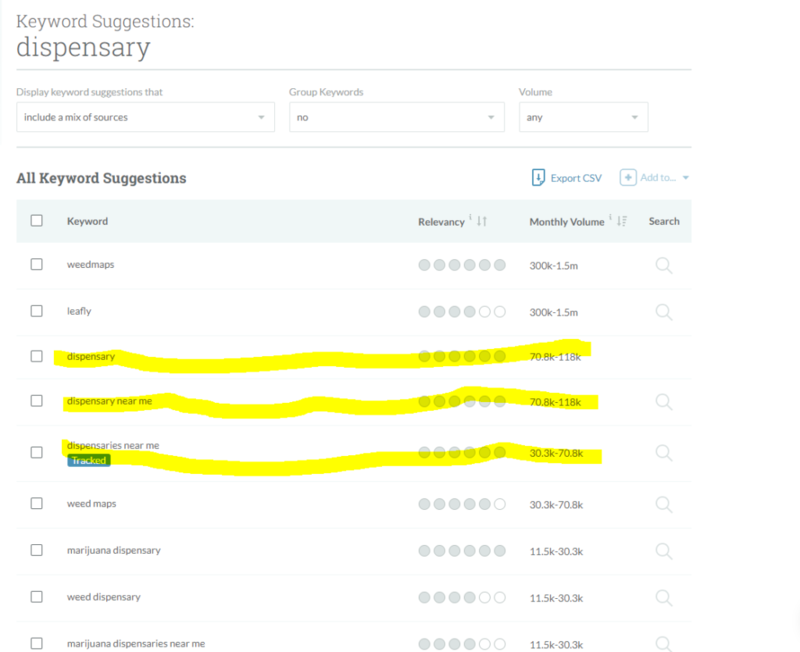 As you can see besides the branded websites Weedmaps and Leafly the next highest searched terms are the following. Dispensary at 70,000 To 118,000 Searches per month. Dispensary near me at 70,000 to 118,000 searchers per month. Dispensaries near me comes in at third at 30,000 to 70,000 searches per month. So obviously I would optimize the website to try to capture those top keywords which is exactly what I did. 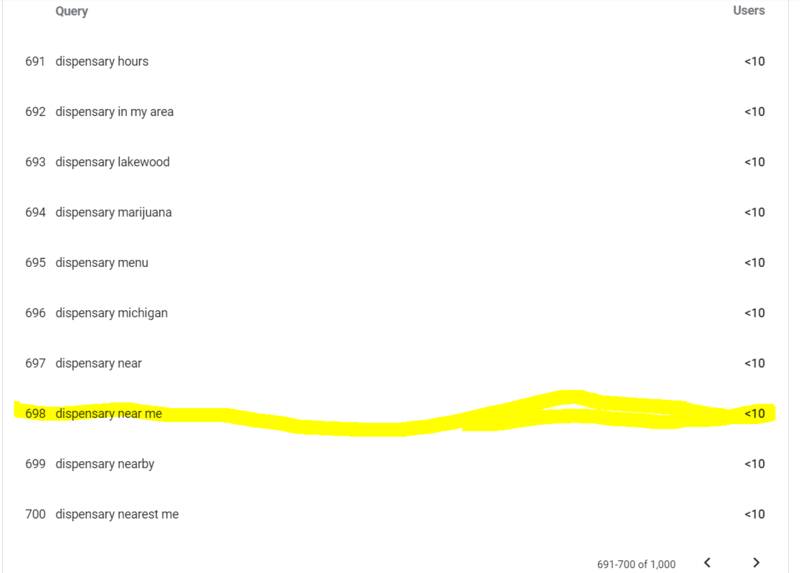 However when you got to Google and type Dispensaries Near Tacoma you get the following results. 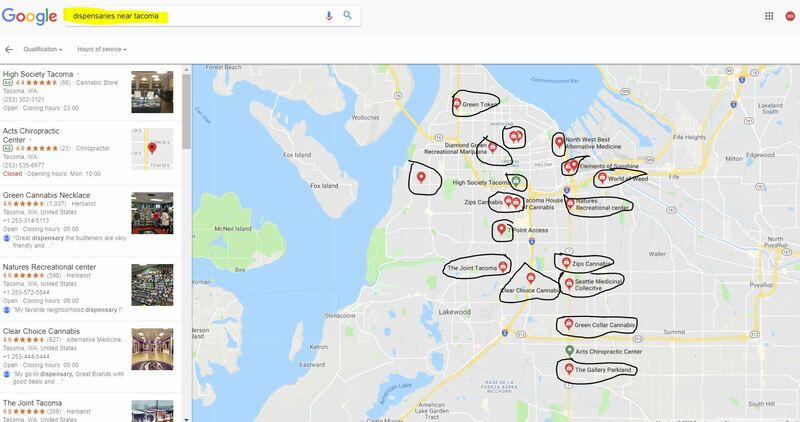 My client Green Collar Cannabis comes up number one behind the two paid Google ads and over 20 dispensaries show up on the map. This is what you would normally expect. Now change that same search phrase to Dispensary Near Tacoma and here are the following results I receive. Not only does my clients business dispensary but 17 other similar recreational marijuana dispensaries also vanish. 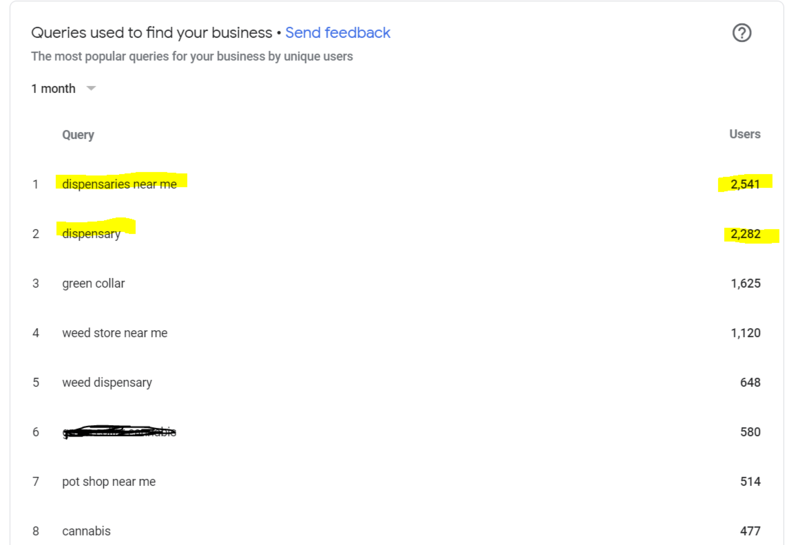 This has a huge impact on the businesses bottom line which can be shown by these Google My Business Reports. In one month my client got 2541 searches for dispensaries near me but less than 10 for the search term dispensary near Me.We know by the Moz Keyword Explorer that Dispensary Near Me gets DOUBLE the searches as Dispensaries Near me so just by doing the math my client is loosing over 5000 potential customers per month. That is NOT exceptable and my clients are pissed that when they search the keyword dispensary near me and they are not showing up on Google Maps. If this would have been a long term keyword with only a hundred or a thousand searches per month this would not be that big of an issue. But as it terms out this is the NUMBER ONE searched term for my clients type of business and I still have not found a solution to the problem. It certainly seems like a bug on Google’s side. And this just doesn’t happen for the city of Tacoma, it is the same for other cities that I have tried. So I am asking any MOZ experts or Google Search Gurus to help us fix this immediatly as this could impact your clients also. We are having problems with our client's businesses disappearing when plurals are being used on local Google Search.